When making your list of Easter gifts, don’t forget to include your child’s teacher. Let her know how much you appreciate her by sending her a sentimental gift for the Easter holiday season. If you are having trouble trying to decide what to buy her, use the gift guide below to help. Which one of these gifts will you choose to brighten her day this Easter? Teachers often look for ways to reward her students when they behave or do well in class. 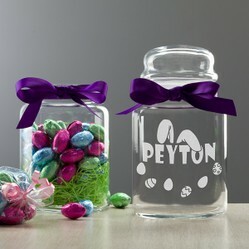 A personalized treat jar filled with candy is the perfect Easter gift for your child’s teacher. The jar will serve as a keepsake and memory of teaching your child. It will adorn her desk and classroom for years to come. Get this Personalized Glass Jar. Choose to give her a coffee mug with a rhinestone monogram of the first letter of her name. Spruce up the gift by including a package of gourmet coffee from a popular coffee shop. Add in a box of coffee cakes and you will have a gift basket that she is sure to love. Buy this Beautiful Coffee Mug for Your Teacher. If your gift of choice for your child’s teacher is a bouquet of flowers, choose to put them in a beautiful vase. Get your child to find out what her favorite flower is or simply fill the floral monogrammed vase with beautiful spring flowers that often represent the Easter season. Will flowers be your choice for an Easter gift? If so, make them extra special by including a monogrammed vase. Buy this Floral Monogrammed Personalized Vase. If your child’s teacher has expressed an interest in cooking, this is the perfect gift for any occasion, including Easter. Include a few of your favorite recipes to help her get her collection started. You can buy this Personalized Recipe Box from here. Choose to give all of your child’s teachers a special thank you by giving out Easter cards. Most people expect Christmas cards but very few expect to get cards in the mail during the Easter season. This is sure to be a treat for your child’s teachers and brighten up the Easter season. Give a Happy Easter Greeting card to your teacher. Help her decorate her classroom for the Easter season with a personalized door banner. This is the perfect way to get all of the children in the class excited about the holiday and will be a gift that she can use for years to come. This is a truly unique gift that she is sure to love and appreciate. Put a little thank you note on the back of it reminding her how appreciative you are of her. Help welcome everyone into her classroom with a “Hoppy Easter” personalized door banner that boasts a cute Easter Bunny on the front. Buy this Hoppy Easter Personalized Door Banner. Use the list of best Easter gifts for teachers when choosing the perfect gift for your child’s teacher this season. She will love and appreciate the thoughtfulness. Really nice ideas and the article looks terrific too!